Rats inspect each other's teeth for available excess food, and this behavior is normal for rat relations, which is a signal to us humans to permit them to inspect our teeth as well. This can be part of the bonding experience between rats and humans, as rats then treat us more like rats. Whoever sent this to me, you are very brave to tell the truth. Rats need to check their human's mouth and remove excess food and especially salt. In doing so, each learns to bow to the other's authority. This means the behavior helps the rats find their place in the social hierarchy. Your rats need to put you in your place and put themselves in place for you. IMPORTANT WARNINGS: If your rat is still learning the fine art of human anatomy, and doing lots of chomp-stop-checks, she may be too enthusiastic a rodentist, and need help from you to calm down. You can give soft and insistent "eeps" if needed, and she will quickly learn what pressure and activities are optimum. This may take some time. In some cases, some rats may not understand their limits and may nip as they think you are yummy food. You should be very familiar with your rat's teeth activities on other parts of your body, and have a sense of her self-control, before permitting rodentistry. 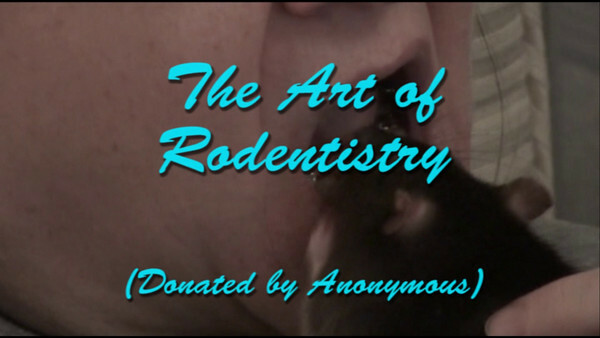 If a rat requests a rodentist appointment, you can permit her a tenative inspection, but be prepared to pull her back. Well socialized rats go out of their way to *not* bite their human, but be aware there is some risk to allowing this practice. Be careful. Then, if your rat is a sensitive specialist, in addition to rodentistry increasing the bond between you, your rat will do a great job of actually cleaning your teeth. They scrape tarter, check for loose fillings and remove them if needed, check for loose teeth, insure the tongue is attached properly, confirm the throat is clear, and remove excess saliva. This I have been told by those in the know. While some people do complain about transmission of bacteria, I know of no reports of rodentistry causing infection, and no rat diseases can be transmitted via rodentistry.